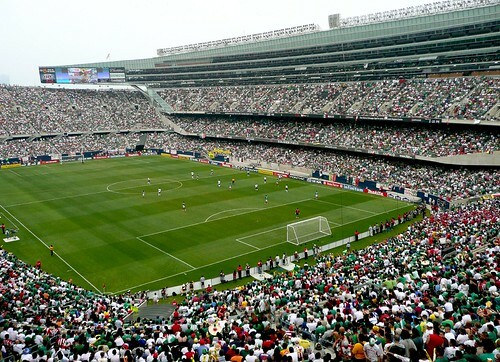 A sold-out Soldier Field in Chicago saw Mexico take on the United States in the CONCACAF Gold Cup final. 60,000 showed up, with perhaps 50,000 of them coming from Chicago’s million-strong Hispanic population. A few fans professed love for both their native and adopted countries, and they received plenty of curious looks and banter for doing so. 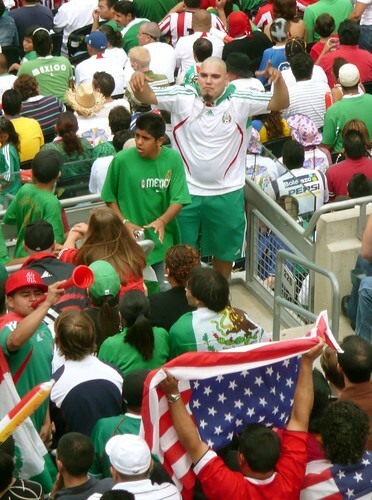 Others were more partisan, such as Sam’s Army and the Mexico fans in green surrounding them. There was plenty of back-and-forth banter, but for the most part, it stayed light-hearted. 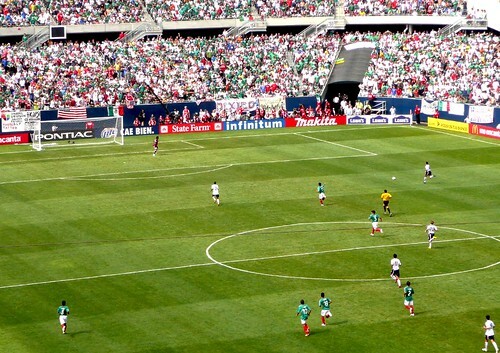 Mexico’s fans were louder and more boisterous in the first half, as they went in 1-0 up, and their vast numbers – perhaps a 10-1 ratio – made it feel like a game south of the Rio Grande. Donovan’s penalty in the second half tied things up, and chants of U-S-A began to resonate around the stadium. It seemed, suddenly, like a large proportion of the crowd was now cheering for the U.S.
And Sam’s Army had the last laugh. After a Donovan penalty tied it, the U.S. took the lead with just fifteen minutes to go, sending their diehards home happy with a 2-1 win. The day was not all peace and light. After the game, troubled flared in a few spots. Overall, though, it was a fantastic game, the crowd was lively, and soccer in America felt like a bigtime sport. That may have been a mirage just for one warm summer’s day, but it felt good anyway. And on a non-crowd related note: all 60,000 were equally shocked when Beasley managed to miss from this Donovan breakaway. Still, U.S. fans can laugh about it now, and Mexico’s supporters will wonder if they’ll ever break the hex their neighbour to the north hold over them. I have to admit, I’m a bit shocked by the crowd numbers. 5/6 of a stadium filled by away fans in a major final? It’s very difficult to imagine those numbers coming up in any other set of circumstances. But I guess the Gold Cup is stunted by a lack of media coverage in the US? On a related note, will the Copa America receive any coverage, now that the US has decided to send a relatively inexperienced squad? Max made the point here recently that even many fans of soccer in America are not very interested in the US team – and apart from Hispanic fans, that’s not a very big demographic to begin with. The Gold Cup just didn’t have any buzz outside of the Hispanic media. Copa America is on a niche soccer TV channel, so whilst soccer aficionados will feast on it, it probably wouldn’t have received much coverage anyway unfortunately. Though people are more likely to tune in with the big South American teams playing than for the minnows in the Gold Cup. Great photos! Watched every minute of the game on FSC and the atmosphere was absolutely electric, which the pics show. As far as the % of the crowd there to support Mexico versus those there to support the US, there are lots of factors. 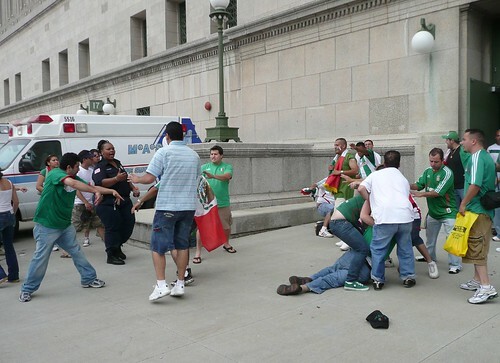 For starters, Chicago, and the extended area known as Chicagoland, has a very vibrant Mexican community and they showed up. 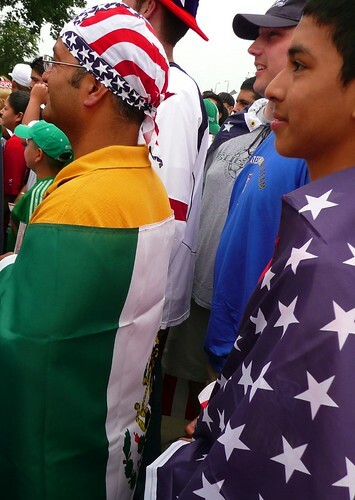 Like many immigrants though, subsequent generations of Mexican-Americans are likely to support both the US and Mexico. 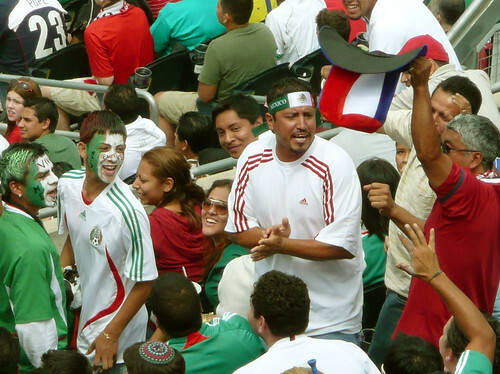 When the “USA” chant was echoing through Soldier Field in the second half, it certainly sounded like plenty of folks there to support Mexico were chiming in. When you look at the growth of Sam’s Army and support the men’s national team, it’s been slowly but surely increasing for years. It’s always going to be tough to get a pro-USA crowd in huge metropolis with tons of immigrants but we’re getting there. Keep on winning and we’re gonna get there even faster. Nice pictures! Count me among those shocked by how loud the “USA” chants were towards the end. 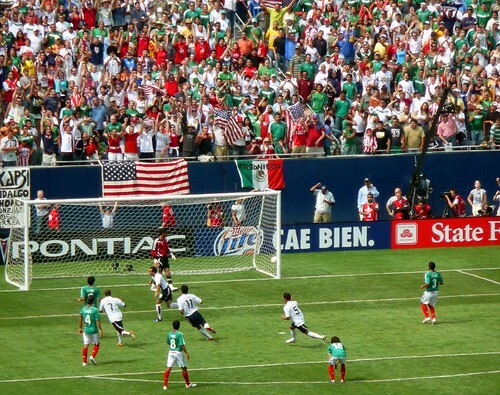 My favorite bit was when the Mexicans tried to drown it out with a “Mexico” chant of their own but it fell flat and the “USA’s” continued to ring out around the stadium. Great shots Thomas. It really is great to see 60,000 people watching football in America, even if it was 90% Mexican. It’s interesting that here in Canada the national team received the most mainstream media coverage I have ever seen them get, but that was only after the semi-final USA loss. In a way that blown offside call might have been a good thing for the exposure of the team, very odd. Wonderful photos…. 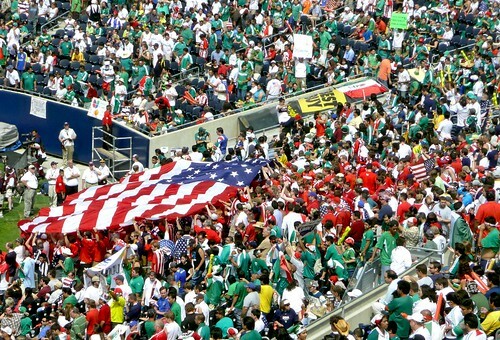 the fact that most in the crowd were for Mexico only makes the US teams effort more impressive. They played their hearts out. GOOD JOB! 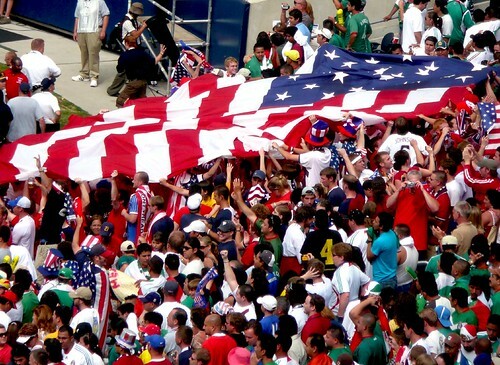 I think one of the biggest issues facing US Soccer is the income level of its fanbase. Soccer will never be the sport of our fathers (my dad is 51), so it’s left to us twenty-somethings to begin the revolution in this country. There’s one major hurdle, along with a few smaller ones, most of us in our twentys are paying off our huge student loan debt, and can barely afford cable or the bar tab required to even catch games on TV, let alone shelling out money for a ticket and traveling to games. I am currently starting a savings account for tickets and travel for the 2010 qualifiers (my girlfriend thinks it’s for our wedding), sssshhhhhhh!!!! ), so that I can at least attend the matches within an eight hours drive of Chicago. Thanks for your insights, everyone. I’ll admit, I live in country where soccer gets almost no coverage at all (New Zealand, where the national sport is rugby union), so I’m curious to see how things go in the US.